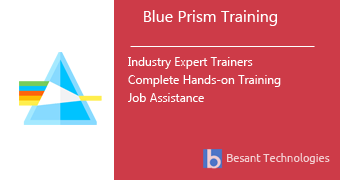 Besant Technologies takes pride in stating that it offers the best Blue Prism	Training in Bangalore. What make our course even more valuable are the faculty members that impart the lessons; they are expert professionals and have tremendous theoretical and empirical knowledge. The instructors have years of experience of working in MNCs, dealing in Blue Prism and related technologies. What sets us apart is the fact that we offer Blue Prism Training in Bangalore in a practical manner, as per industry needs and standards. The range of services provided by our esteemed team of trainers includes Blue Prism Corporate Training services, Blue Prism Online Training as well as Blue Prism in Classroom training. Our syllabus has been designed in a way to meet real world requirements, not just to suit the beginner level students but also for those looking to receive advanced level training. The training that we provide is also very flexible in that it is made available on weekdays as well as weekends based on the demand and convenience of the candidates. Best Blue Prism Training in Bangalore Offered by Certified Experts. Besant technologies Rated as No 1 Blue Prism Training Institute in Bangalore with Placements. It is a modern age of technology. Our world is driven by the booming technology-oriented industry. As the age of technology is advancing, so is the demand for software developers and programmers. Blue Prism is a Robotic Automation Software which has recently gained a lot of popularity. There is an ever-increasing demand and lucrative prospects for Blue Prism Developers. To get the perfect mentor to master the skills of Blue Prism Robotic Automation Software, join Besant Technologies, which is the top-rated Blue Prism institute in Bangalore. Besant technologies is rated highly and ranks among the top IT institutes in Bangalore. The reason behind this is the extremely talented and experienced faculty, the latest technological tools to impart classroom education, lab facilities, real-time & project-based training and 100% placement assistance for all the aspirants. It offers the enterprises an opportunity to create a robotic workforce which can deal with immense data in a quick, efficient, reliable and secure manner. This technology is really hot in the market today and promises the Blue Prism trained individual’s highly successful and lucrative career in the corporate IT world. Besant technologies provides Blue Prism training to both fresher’s as well as working professionals. We offer real-time practical based training to our trainees. After the successful completion of the course, we ensure you 100% placement assistance to get into a secure job position in any of the major MNC companies around the globe. The trainers at our institute are vastly experienced and knowledgeable as they are experts from the industry. You get to learn the basics to the most advanced concepts and skills related to Blue Prism Training. The syllabus is based on the needs of the industry to achieve everyone’s goal. Aptitude and soft skill training workshops to boost the confidence, enhance the communication skills and create enthralling personalities which are essential to get job positions at MNC’s. Our institute is equipped with the best lab facilities and excellent infrastructure to provide real-time Blue Prism training experience to all IT aspirants enrolled at Besant Technologies. The faculty at Besant Technologies consists of experts from the industry itself. They are highly experienced as well as they possess up to date knowledge. They know the in and out of the industry. The course curriculum is revised every semester by the experts to meet the trending requirements of the industry. Our faculty believe in more practical based learning and quality learning. Not only the concepts and skills but overall personality grooming session is held during the course to make the trainees fully prepared to enter the IT world and secure successful job positions for themselves. The certification for Blue Prism Training is a professional credential added to the CV of our trainees. We at Besant Technologies provide certification based training for Blue Prism. The certificates are globally accredited by all major IT companies of the world. We at Besant Technologies provide full assistance through aptitude training, soft skill training, and one on one mock interviews with the industry experts to prepare the trainees to crack interviews at all major companies and earn themselves a secure position. Since, we are focused on imparting a One-to-One Blue Prism Training in Bangalore, our trainees get to acquire a lot from the course. Our Fast-Track Blue Prism Training in Bangalore also ensures that they learn the most within the least possible time. Here are the major topics we cover under this Blue Prism course Syllabus Introduction to BluePrism, Overview of BluePrism Modules, Application Modeler provides 4 types of spy modes. Every topic will be covered in mostly practical way with examples. Here are the Blue Prism Training Classes in Bangalore Schedule in our branches. If this schedule doesn't match please let us know. We will try to arrange appropriate timings based on your interest. Mentors train Blue Prism in Bangalore not only to assist students in implementing live projects, but also to hold a preparatory session for the interview along with community outreach. Besant Technologies branches in Bangalore are listed above. And most popular locations where students / professionals are in just few Kilometers away from below mentioned locations lining up to get Blue Prism training with us.